Join Calvary Women’s Services for an evening of signature cocktails and delicious hors-d’oeuvres at Baby Wale, a hip gastro-pub in DC’s Mount Vernon Square. We’ll come together to celebrate women overcoming homelessness and look forward to the warmer weather of spring. The event will take place on Wednesday, March 14th from 6:00 pm to 8:00 pm. 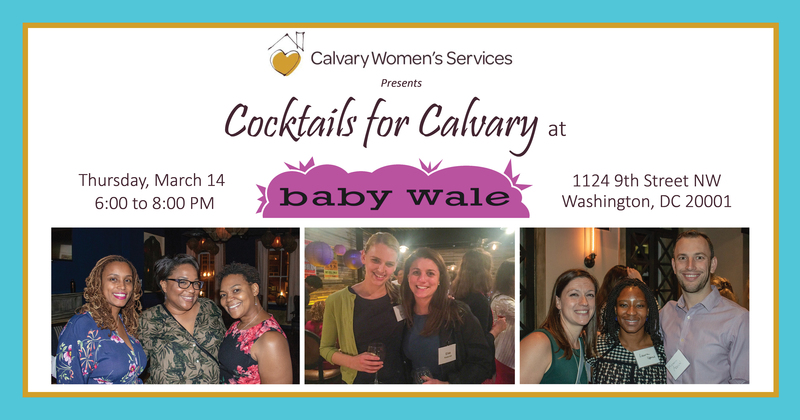 This is a great opportunity to invite friends, family, coworkers or networks to learn more about Calvary’s mission and the women we serve. Tickets are $25 each. You’ll also receive a discount when you purchase two or more tickets! Baby Wale is located at 1124 9th St NW, Washington, DC 20001. More information, including how to purchase tickets, is available on the event page. For those unable to attend, please consider making a donation.